finally, some sewing around here! It's been quite a while since I posted anything about crafting or sewing. I've been taking a break from the sewing machine, but now we are reunited and it feels so good. Here are a few pictures to give you an idea of how it came together. I loosely followed the directions in the book, but did a lot of improvising. The directions didn't have any pictures, so that's just me being impatient and wanting to figure it out myself. ;) I started by cutting off my jeans right below the back pockets. I used the bottom half of the leg and trimmed it down to size, leaving the seam intact along the bottom edge. That seam became the bottom seam of the bag. I left a little seam allowance on the sides. Also VERY IMPORTANT- use a jeans needle and jeans thread. That way you won't cry. I turned that little section right sides together and stitched up the sides, leaving the top part open of course. I didn't like the square corners, so I rounded them off (see, there I go improvising again). Right sides together, I pinned this bottom part of the bag to the top part of the bag, lining up those uneven edges. Turn that bag right side out and ta da! The book says to use an old canvas belt for a strap, but I decided to make a wide tube using the other jeans leg. I stitched it up one side, turned the tube right side out, and attatched it to the bag at the sides. That's quite a few layers to sew through but the right needle and thread makes it pretty easy. It's also ok to turn the wheel by hand to get over those thick parts. I used another section of jeans leg to make a flap. I wanted a flap almost the size of the bag. There I go improvising and not following directions again. I also cut up a thrifted 80's t-shirt, using the denim flap as a template. Stitched those two right sides together (leaving the top open), turned it right side out, pressed the whole thing down, and did a little topstich around the edges. Pinned the flap to the outside of the back waistband of the bag (making sure the side I wanted was going to face out) and sewed that right together. That's all. Pretty darned easy. I'd keep it for myself, but honestly, I'd burn ice cubes if given half the chance. If you're up to the task of planning a slumber party or a Holiday in Mexico Prom or a Sukiyaki Party for the gang, then you're a better woman (or man) than I. If cooking isn't your thing, then there's this, which is actually quite practical! work in progress- a new Halloween dress! I had so many great costume ideas for Halloween this year, and like every year I waited until the last minute and didn't actually do anything. Oops. Nothing like Halloween procratination! I picked the fabric first, not even knowing what I'd do with it. Joann's had Halloween fabric on sale for 60% off last week, so for $3.19 a yard how could I resist? I bought it all (6 yards) since pink and black is one of my favorite color combos. I blame it on all the new wave album covers and Good & Plenty of my misspent youth. Besides, the pink spiders are so cute with their lace pattern! If real spiders were this cute, perhaps I wouldn't dislike them so much. This year's model is Simplicity 2886. I've had this pattern in my stash for a while but for some reason forgot all about it. The weather is still really warm, so why not try it now? I think it's a pretty easy dress to make, and I only goofed a couple of times in my typical fashion. For example, I assumed it was a zip up the back dress but it's a side zip. I somehow skipped the one step in the directions that would have told me this, but something about my brain will not allow me to sew something correctly from start to finish. This is what seam rippers are for. It looks misshapen because there's no zipper in the side yet. All I need to do is add the zipper (wish me luck on this one- zippers are my Achille's Heel) and hem the bottom. There may not be time for the matching bolero (!!!) but we'll see. I'll post some pictures when it's all done. Just for fun I thought I'd throw in a picture of my pattern weights. I've ruined enough patterns sticking pins all through them, and these paper weights work just dandy. Hi! Sorry I haven't been keeping up on posting. My camera's been in the shop (twice!) and now it's back, so keep your fingers crossed for me. So I'll jump right in- I'm still participating in the Wardrobe Refashion AND I know a lot of you out there are fans of Alabama Chanin or the Alabama Stitch Book. I'm on that list too, since I am a big fan of recycling (AKA weraing my clothes to death) and discovered that I like hand sewing more than I thought. It's actually hand mending I don't like! 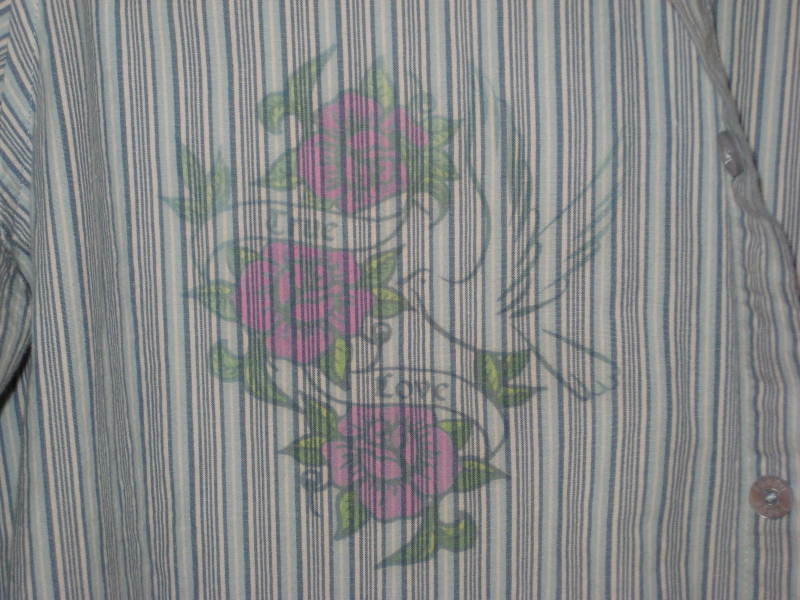 This is an old t-shirt I bought at the store a while back, and reverse applique using the stencil that comes with the Alabama Stich Book. Black cotton knit compliments of another old t-shirt that sacrificed itself for other projects. Finally, something to do with all those t-shirt scraps left over from the t-shirt quilt! There are so many gorgeous projects over on this Flickr group- why don't you go take a look? Inspired by the talented ladies at Lindamade and Darling Petunia, I wanted to make my own version of Simplicity 3835 AKA the Built By Wendy top. It's also been dang hot around here, so the the time is right for light 'n' loose clothing. I'll be honest, I never thought I would want to make a top like this. I thought it might be a little too sack-like for me. There are so many cute versions of it out there (check out this Flickr group), I thought I'd give it a try. I'm glad I did! It's a pretty quick project, comfy, and I've received a lot of compliments, too. Why yes, I do have a ton of that fabric left, why do you ask? 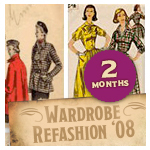 I signed up for Wardrobe Refashion last Spring/Summer, taking the two month pledge. I've been following along in the last year and was inspired to try it again. Wish me luck! I pledge that I shall abstain from the purchase of "new" manufactured items of clothing, for the period of 2 months. I pledge that I shall refashion, renovate, recycle preloved items for myself with my own hands in fabric, yarn or other medium for the term of my contract. I pledge that I will share the love and post a photo of my refashioned, renovoted, recycled, crafted or created item of clothing on the Wardrobe Refashion blog, so that others may share the joy that thy thriftiness brings! For my first project I posted this bag I made from an embroidered table runner I got at the flea market. Is anyone else out there signed up on Wardrobe Refashion? I'd love to see what you're making these days! Not too long ago I found this cute cotton fabric at JoAnn's and for something like $2.75 a yard! Something about the bright colors on a black background combo has always appealed to me, and I felt like this fabric was waiting there just for me. For that price, I scooped up several yards! I wasn't sure what I wanted to make first. Inspired by this lovely skirt and the lovely PaperDollyGirl, I started with a wrap skirt. I picked out this FREE PATTERN (!) from Fitz a while ago but I had never tried it. I made a few small changes. I did the long tie belt, but it didn't really flatter me since I like to wear my shirt over my skirt and the tie added some extra bulk underneath my shirt. I prefer a flat & more fitted waistband, so I chopped off the tie belt and made a waistband that closed with buttons instead. I also added bias tape around the edges. I love me some bias tape! One thing I really like about this skirt is the kangaroo pocket in front. Very handy for stashing your keys or lip balm. I found this frumpalicious elastic waist skirt at the thrift store for a couple of bucks. I have a sneaking suspicion that it was somebody's home ec project due to the variety of threads and stitches used. It was kind of weird. The fabric was too cute to resist and I knew it wanted to be something else- but what? The man of the house suggested a dress. Now why didn't I think of that?!? I based it on McCall's 5425. Mostly I just winged it. You can pretty much tell how this dress is made by looking at the picture on the envelope. Yes, it was just that easy! Now don't go thinking I'm all modest because my head is cut off in this picture. I was using the camera timer and gosh darn it, I'm just not that good at taking my own picture. Now I personally like the potato sack dress/muu muu style because it's oh-so-comfy and hides those figure flaws we all know and love, but there is also the optional sash if you like. This dress was really easy to make and even easier to wear. 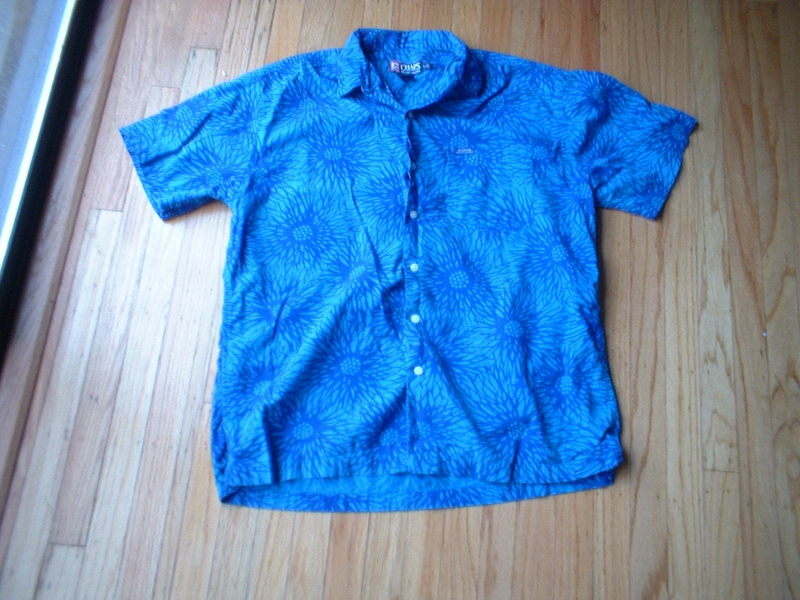 This could be one of my summer staples if I make it in a few different colors. I'm laid back like that. 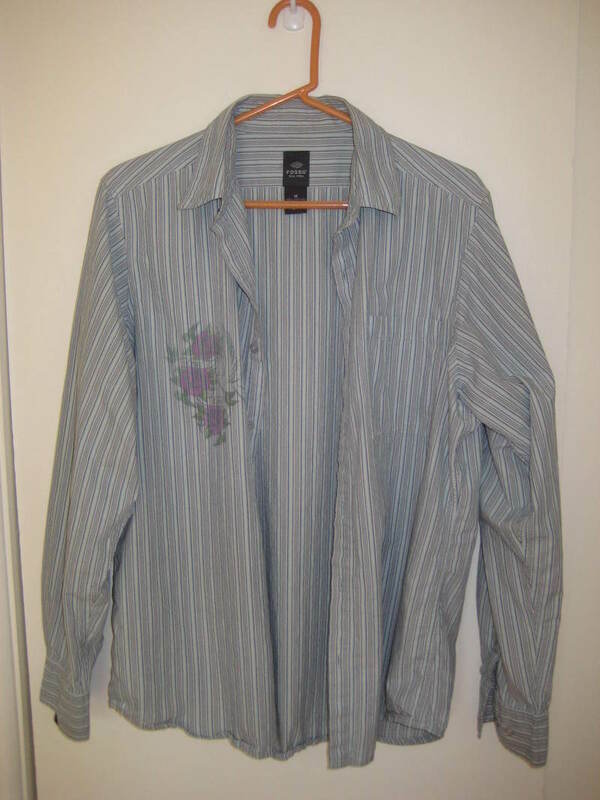 I started out with another man shirt I picked up last year from the thrift store. Nope, that's not a stain on the front. It's an iron-on! Nothing is easier than an iron-on. I didn't get much use out of it as a long-sleeve but wasn't sure I wanted to toss it into the donation pile. Then I saw this shirt at Target and thought, "I can do that!" 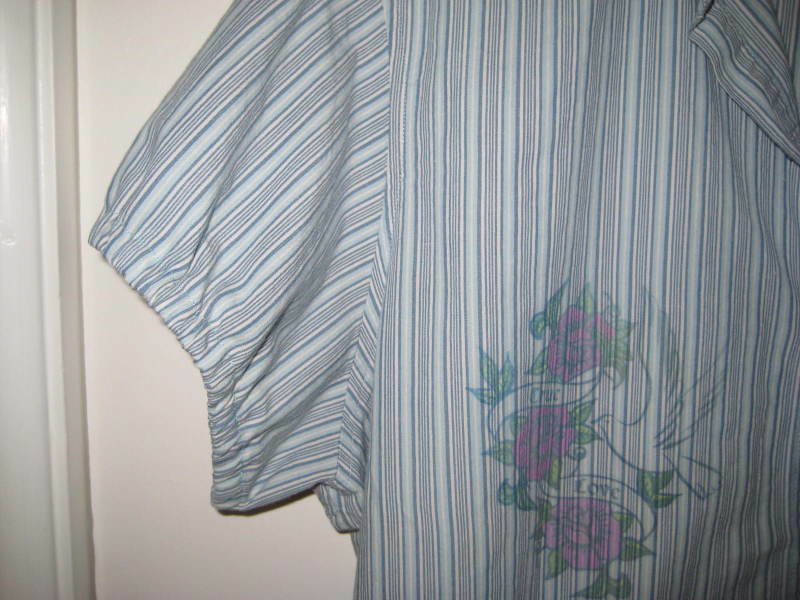 Using another short sleeve shirt as a pattern, I cut the sleeves off at an angle. I made a casing all the way around each sleeve and ran some 1/2 " elastic through it. Not too snug so I could move my arms. That's all there is to it! I also added a few narrow darts to the back for shape. This was a super quick project and really easy. 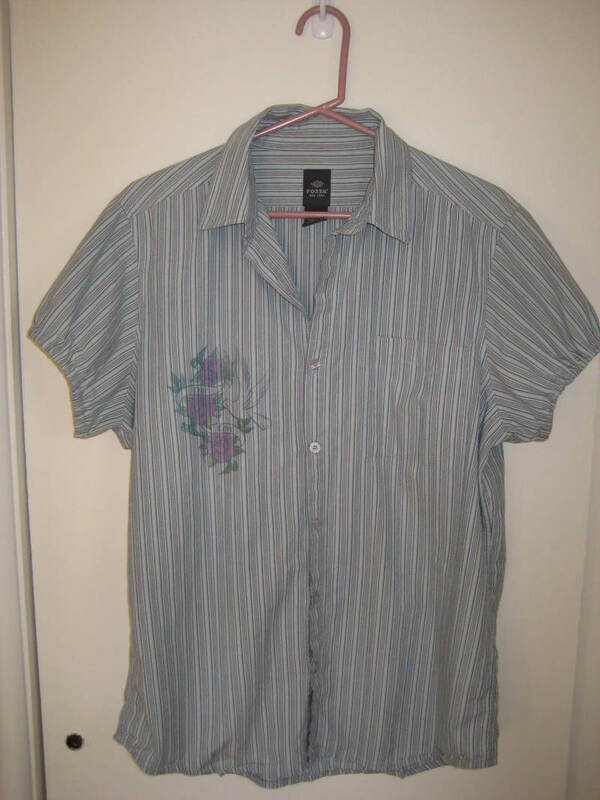 Now I have another shirt made from stuff I already had around the house. Nice! Wait- I really haven't checked in for a whole month? Oops, my bad. I'll have to do something about that. How about an easy sewing project? 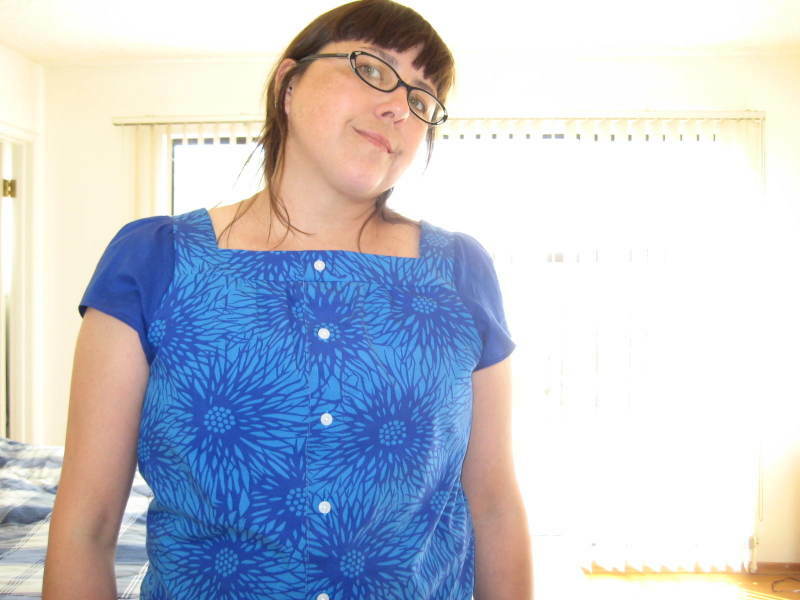 and using Simplicity 4589, I turned it into a summer top for me! The sleeves are a little bit of solid cotton from the fabric store, and I actually sewed the front shut. It's pullover style. I may change the buttons to something cute later, but I haven't decided yet.